Valuable information about the operating status of machines can be confortably reported on the transmitting units of radio remote controls. So, WAVE2 can be equipped with coloured LEDs and 2’’ 64x102 pixel graphic display, while ARES2 and KRON can be equipped with coloured LEDs and buzzer, and finally, ZEUS2 and THOR2 can be equipped respectively with 3,5’’ 64x128 pixel and 4’’ 104x160 pixel graphic displays. ADD BOX is a support integrated in ZEUS2 and THOR2 handles that adds flexibility to the radio remote control. The support integrates the graphic display of the DATAFEEDBACK option. The screen size dimensions is 128x64 pixel for ZEUS2 and 160x140 pixel for THOR2. In addition, coloured LEDs can be present in the frame of the display. Useful small buttons (or rotary switches) can be situated on the side to be used for scrolling and paging functions. The support is totally dedicated to fit the DATAFEEDBACK LEDs. The optimal positioning of ADD BOX LED guarantees an immediate visibility of the informations. The support is used as extension of the useful surface dedicated to commands. 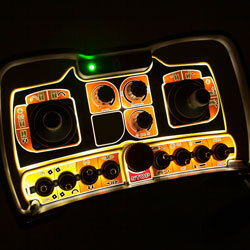 Pushbuttons are allowed on the top and rotary switches on the sides. The 3.5” color graphic display is available for the THOR2-model radio remote controls. The high brightness (1.000 cd/m2) and the 65.000 reproducible colors, allow for a clear and sharp display, even in environments with intense sunlight. It is easily upgradable and programmable via USB with a dedicated software. KRON, ZEUS2, THOR2 and G4 transmitters can be equipped with wires serial connection to the receiver. The direct cable connection excludes the radio tranmission, overcoming any problem related to signal noise or to the use of the product in areas where radiofrequency is not permitted, or due to the exhaustion of the battery. The MTRS option is desinated to all applications in which the operator must be able to get the control of sharable machinery or coupled machines, keeping safety at top. In a multi-transmitter-receiver system, each receiver is able to recognize maximum of 8 distinct transmitters, with which operate one at a time, and each transmitter i able to to select up to 8 combinations of receivers (single or groups). MTRS is available in the MTRS Standard and Easy versions. They differ from each otherfor the procedure of the LOCK and UNLOCK procedure. Tandem: a transmitter controls two receivers simultaneously. Trio: a transmitter controls three receivers simultaneously. Master-Slave: the Master transmitters can control any receivers of the system, while the slave transmitter only its own. Catch/Release: this procedure allows an easy and immediate sharing of a receiver by more operators through locking and unlocking procedures. Infact, vatch/release is used to couple cranes for tandem operation, or to share a conveyor belt or an overhead crane in a galvanic plant. 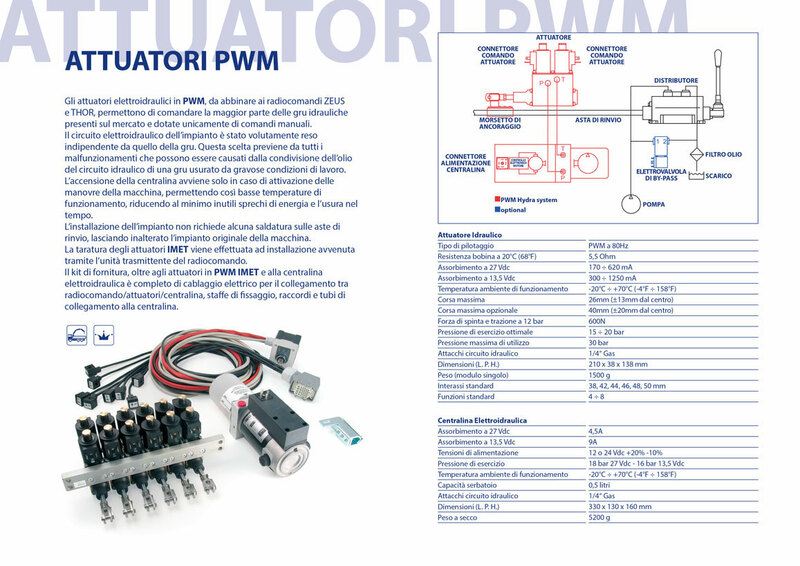 The functioning of the Tilt Sensor ca be customized according to customer requirements and to the level of safety required: from the simple activation of predefined functions (i.e. horn signal), upto the suspension of all functions of the radio remote control. The radio remote control equipped with iReady option requires the operator to point the transmitter towards the specific machine he intends to turn on within 20 m range. This option guarantees so, more security in working situations in which are present several radio remote controlled machines, likely to be confused with each other. 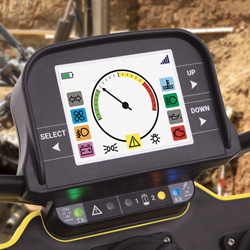 The DSC (Dynamic Speed Control) function features a selector “+/-“ on the transmitter that allows the istantaneous regulation of the movements speed while you operate in a “slow speed” mode. 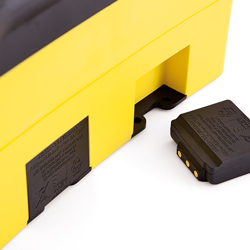 This feature is available on THOR2 and consists in a double battery compartment. Once the accumulator currently in use enters in the "low battery" status, the transmitter automatically switches to the second accumulator. This process takes place without power interruption; hence, without transmitter shut down. It is the ideal optin when the radio remote controlled machine has to operate continuosly for long periods of time. The MTS option allows to have a radio remote control with back-up transmitters that can be immediately activated zeroing the breakdown time. Each radio remote control can count on up to 256 spare transmitters. 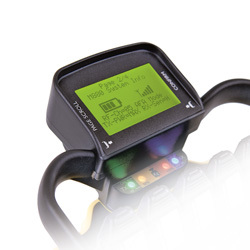 This option is available on all waist-belt type of transmitters and grants a perfect readability of the transmitter panel in gloom or low-light situations. KAPTA option allows to pair in few seconds a replacement of the units. 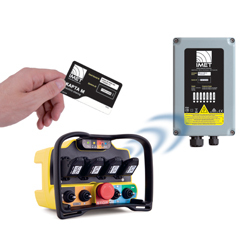 For this purpose the transmitting units include a wireless reader and the receiving units come with a smart card. Executing a proper procedure the units can be paired permanently and with exclusive control. 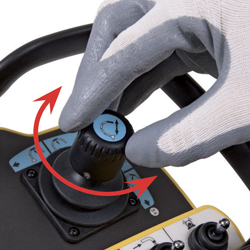 The tri-axial joystick, featuring a rotating return-to-center knob, allows enabling an additional proportional or ON-OFF function having category PL d on the joystick itself.